K pod crossed the Oregon border yesterday on their way back north. The latest satellite data from this morning places the orcas near Port Orford, Ore., according to an update from Robin Baird of Cascadia Research, who is helping with the tracking effort. Killer whale experts were anticipating yesterday that K pod might make it to Monterey Bay and perhaps a little farther south, as I described in a story in this morning’s Kitsap Sun. Everyone was wondering exactly where these whales would linger and where they would eventually turn around and return north. Robin Baird of Cascadia Research Collective reported this morning that satellite data showed that the whales had turned around last night after reaching Point Reyes, which is north of San Francisco Bay. 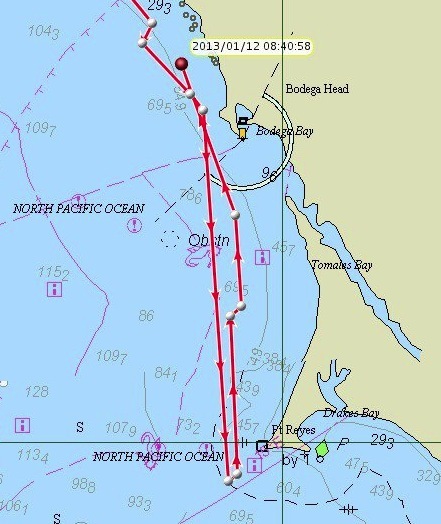 They continued rapidly north, reaching Bodega Bay this morning. Where K pod will travel next is anyone’s guess. But, if we’ve learned anything through the years about Southern Residents, we know that they will remain unpredictable. I’ll keep reporting their travels as long as they seem interesting.